Life in Italy is beautiful Yes, for sure, I love traveling to Italy whenever I can. The more I visit Italy, the more I learn from the Italian people and their beautiful lifestyle. You gotta love the Italians. I find some situations amusing, even if, at the time, they might also be frustrating. But I’ve learned over time, to go with the flow, to be flexible, and to accept that this is part of Italy. And you gotta love the Italians. So here are a few things I find that happen quite often and make me smile. Are you ready? Nothing happens fast in Italy I’ve had friends tell me they emailed a business in Italy yesterday and haven’t heard back yet. My reply is “nothing happens fast in Italy.” Italians like to enjoy life, and take their time to do so. Hence the expression, “il dolce far niente,” or “the sweetness of doing nothing.” Maybe in a week, or even later, you might hear back. But don’t give up. Eventually you’ll hear something. A second email might be a good idea, but don’t expect an answer any sooner. You gotta love the Italians. And they always say it with a smile, to make it a positive thing. Gotta love the Italians. Italians love to simplify things, at least in their minds. How many times do I hear “va bene, va bene,” repeated for emphasis. It’s meaning is “it’s okay.” But the flip side happens when I wish to do something that I assume might be a simple thing, like find the register for the year my grandfather was born in the small commune in Italy. Now the answer is either, “molto difficile,” very difficult,” or “non è possibile,” it is not possible. “Why?” I ask. The person looks at me with and with a facial expression and hand gesture, and utter one word, ‘boh.” Boh can mean a hundred things but in this instance, it means, “no reason,” and there is no explanation. “Boh” is slang for “non lo so,” or “I don’t know.” The simple word can come in handy very often in Italy. I find that I’ve used it myself. Funny? Not always. Frustrating sometimes. This is why I say that it’s different for those of us who travel to Italy for a visit and for expats who decide to take up residence in Italy. They have to deal with the frustrating part much more. But you gotta love the Italians. What have your experiences been in Italy? Funny? Frustrating? I’d love to hear your stories. For more on my experiences as a solo traveler in Italy, you may enjoy Memoirs of a Solo Traveler – My Love Affair with Italy, winner of the Florida Writers Association award. 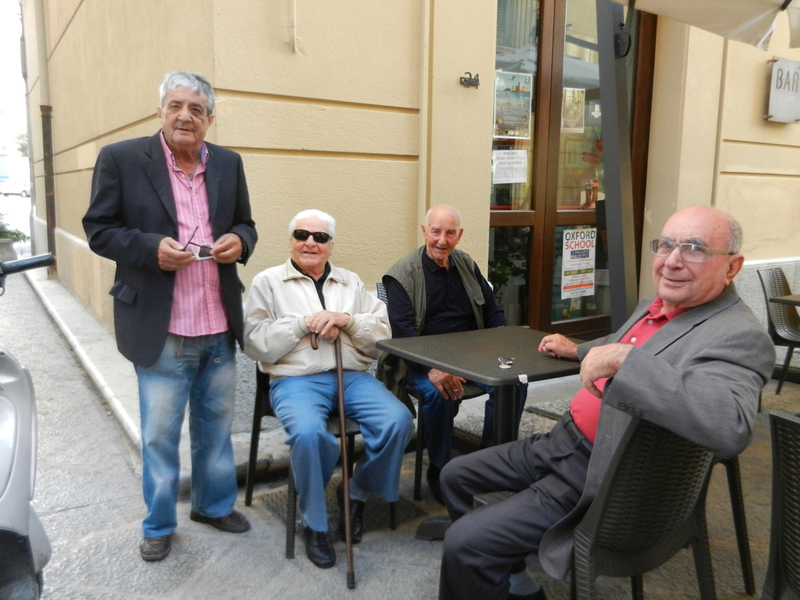 whenever i see the group of men outside the café or in the square, I wonder, where are the women? Thanks Tony…You understand the Italians!! Sempre dritto! Always straight ahead! What Italian street is straight?? In no more than 50 meters (and here, 50 meters is 50 meters), there’s a fork in the road. Do you turn around or just pick one and ask for confirmation from the next person you see? Well, Italians do one thing fast….DRIVE! But you gotta live the Italians, like you say. Thanks Joanne…and thanks for the link to your blog…Great to meet you!!! Great post! We’ve found Italians to be friendly and generous! Last summer, we were dining early in a restaurant on a narrow street near the Pantheon. Our gregarious waiter (possibly the owner or manager) not only gave us appetizers, but when we turned down dessert, he brought us chilled after dinner drinks (much appreciated in the heat wave). I expected to see the items on our bill, but all turned out to be gratis. His lovely gesture left a lasting impression. The food was terrific too! That’s great to hear Victoria…I have always found Italians to be generous. In Italy I’ve been invited into homes of people I had never met before!! After searching in Palermo for a parking space, we found one. It was in a public lot with white stripes meaning free parking. As we were getting out of the car, a gentleman approached with his had out looking for. an euro. This was not the first time an enterprising individual had tried this, so I was aware of the scam. Just said no grazie and walked away. I do not take offense and if he had helped me back in I would have gladly given him an euro. Still, I admire his spirit. . I love the people in your photos. I love the Italians. I’ve been living in the south of Tuscany for four years and visit Rome a lot as well. Even though I’ve also learned about the bad sides – arrogance, condescension, disregard for environment, bribery culture, sense of entitlement, disorganisation – there are many more reasons why you gotta love the Italians. They are loving, enthusiastic, child-like, healthy despite themselves, agile till old age and not whiny about getting old, uncomplicated, stylish, funny and warm. We all could be better off if we were a bit more like them. Thanks for this honest and thoughtful perspective!!!! What a fun post! After only one trip, I certainly understand your love affair with Italy and its warm and welcoming people! Thank you Marilyn…I’m so glad we got to meet in person during your first trip to Bella Italia! I’m sure it won’t be your last!!! And you would know, better than most..Thank you! This is exactly like life in Italy. My husband and I bought a small place in a lovely town called Calitri in the south of Italy ten years ago and we and our family and friends have visited there many times over the years. It’s a simple, uncomplicated way of life apwhich has enriched our lives and we have made many friends. Italians just want you to be happy and they might stretch the truth a bit to make you so. I love reading about your Italian adventures! I went for the first time in September 2017 and I am eager to return!